Samsung’s interest in making sure the American public knows the Galaxy S III is “Designed for Humans” continues to ramp up with the introduction of another TV spot. 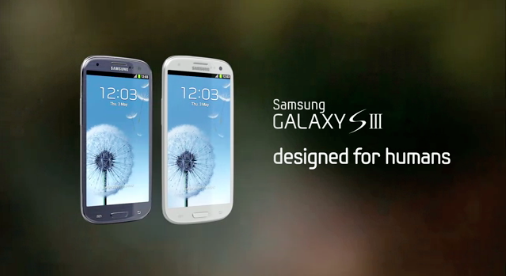 This time, we’re seeing a different side of the Galaxy S III as Samsung’s marketing effort forgoes specs, instead showing how the device will enhance your life. This is exactly what Apple does with their own highly specialized television spots and it works wonders for them, so Samsung is definitely on the right track. Now, we just have to wait and see how the public responds when the Galaxy S III arrives. the one where the guy proposes was pretty kool! i half agree – besides the iphone, minor updates are just those – the macbook pro’s are still macbook pros – not macbook pro s or macbook pro s 2. like, give it a rest samsung. What? Advertise something that most phones at the time do, but pretend it’s a new feature. I can’t wait for their commercial showing turn-by-turn navigation, I’m sure many will call it ground breaking. No, the fact that you even went there makes me laugh. The idea is that Apple does a fantastic job of showing how their products will enrich your lives, something most of their competitors have failed to do. This commercial, does exactly that. It shows how the Galaxy S III will enrich my life. and you just cant get enough can you? They never said anything about “new” or “innovative” in the commercial. They showed how its features can be applied to every day life and make life better. when the guy proposes that was totally awesome… I shud try that too.. It should show the user desperately trying to install an update using KIES mini. They can do better than this. I’m all for them trying to connect with more customers, but I still hate the whole “Designed for Humans” slogan. OF COURSE IT WAS DESIGNED FOR HUMANS! LAST TIME I CHECKED MY DOG OR CAT WEREN’T CAPABLE OF PURCHASING ANYTHING, MUCH LESS A SMARTPHONE ! The proposal scene at the airport was cool! I like the Galaxy series but the idea that this one is designed for Humans is silly and implies that other phones were designed for animals or aliens or idiots… Who is the marketing agency that’s wasting away with this ridiculousness. Does any phone company design anything for customers that are not humans? Whoever from Samsung was responsible for this campaign should be fired. It’s so bad it almost makes me NOT want to buy the phone. I feel like anyone who sees this commercial would laugh at me for owning one. “Waits till you’re asleep”…that’s just creepy and makes you think someone is about to get murdered in their sleep. The reason the iPhone is so popular is because it is the “cool” thing to have. With a name like “Galaxy,” Samsung could have done something really futuristic, eye catching, and original. Instead, they’ve made a sad and cheesy attempt at copying apple – which makes the phone seem like a sad and cheesy attempt at copying apple. Sorry for the rant, but I work in creative and it’s always frustrating to see great products sabotaged by companies that do not understand the art of marketing and branding. I did not think “iphone rip off” at all when I saw this commercial. Like in any way. how can you not see their “creativity” in this commercial. It just appears very low budget and cliche as a whole – I mean the music… I would expect more from such a high profile product. I think its great. Makes me want it even sooner. I can’t wait for it. I hope costco presells it like the HTC one s but not sure they will. If they do it means $25 rebate if not then no rebate. This is the same ad they posted on the day of launch.